To say that no one expected the mammoth success of The Walking Dead when the TV show first aired in 2010 would be an understatement. The Image Comics series of the same name had been steadily rising in popularity since launching in 2003, but no one could’ve predicted the titanic impact that Robert Kirkman and Tony Moore’s zombie tale would have on pop culture. Part of this is because, although TWD may cleverly masquerade as a horror comic, at its core, it’s a story about survival. The book isn’t so much about the zombie apocalypse itself, but rather what we become in the wake of it. While you may be shocked to find a tiger on this list, you really shouldn’t be, because Shiva was an amazing character. Ezekiel – a zookeeper before the outbreak – had formed a close bond with Shiva when she was a cub. He even saved her life, and after, she remained fiercely loyal to him. Shiva was not only Ezekiel’s right hand, but also his best friend. After losing so much, that tiger was all that Ezekiel had left and he loved her. Shiva loved him too and protected him at all costs, even when that cost was her own life. After being introduced in #108, Siva died just ten issues later. She was torn apart by a horde of zombies while saving Ezekiel. Few characters have made an entrance as grand as that of the King of the Kingdom. We first met Ezekiel in #108, with his best girl, Shiva, close by his side. We would later discover that he had a background in theater, which makes sense of his majesty’s histrionics. He played the part of ruler perfectly, although Michonne saw right through him. Before long, the two became romantically involved. He was one of very few people around whom she let down her guard. Ultimately, their relationship didn’t work out, but Michonne had her regrets about that. Ezekiel was instrumental in Negan’s defeat. He may have had a mutually beneficial trade arrangement with the tyrannical ruler of the Saviors, but he was willing to team up with the other communities in order to take him down. Ezekiel had a huge impact on pretty much everyone that he came into contact with. He was an imposing man, but kind and generous as well. Of Ezekiel’s many attributes, perhaps the most poignant aspect of his character was his relationship with Shiva. He saved her life, even neglecting to report that she attacked him in the process. After everything, everyone that he had already lost, he couldn’t bear it when he lost her too. Ezekiel mourned Shiva until the day he died. Dwight’s progression has been unexpected to say the least. That is part of what makes these characters so compelling: the way that TWD continually subverts expectations. Kirkman comes up with inventive ways for the characters to evolve and artist Charlie Adlard is quite adept at expressing their complex emotions. Let’s face it, all of these people have done something unforgivable at some point in the story. It was because of Dwight that Rick and co. were able to defeat Negan in the first place. Dwight served as a good leader to the Saviors after he usurped Negan, who, by the way, not only usurped him first, but also stole his wife. However, he no longer wanted to be a leader and eventually left for Alexandria. Dwight has since become one of Rick’s most trusted lieutenants and has proven himself an integral part of the team. Eugene Porter began as one of the most disposable characters in the comic, but would eventually prove indispensable. He made his first appearance in #53, where he purported to know the classified origins of the outbreak, claiming that the United States government had employed him. Well, he wasn’t a government scientist, so much as a high school science teacher. As for how the plague began? He didn’t actually have a clue. Eugene lied because he wanted a better chance at survival. Although there was a fair amount of weirdness surrounding Eugene, the strangest thing about him would have to be that he apparently kept a mullet in order to make people underestimate his intelligence. Regardless of his confusing hair choices, Eugene was really smart. He became the group’s main source of ammunition after he began crafting bullets. In a post-apocalyptic world, you can’t really get anymore useful than the guy who’s providing everyone with firepower. Seriously, Alexandria would’ve been lost without him, and the guy almost killed himself in order to keep providing for them. Plus, his relationship with Rosita was both unexpected and incredibly touching. Aside from that, Eugene used his big brain to come up with ways of keeping Alexandria secure, such as digging large trenches around the safe-zone and using a horn to round up herds of walkers while on horseback, driving them away from the community. Also, remember when Eugene bit Dwight’s crotch? Amazing. Few characters from the comic got the shaft during their transition from page to screen quite as much as Dale did. While Dale was unequivocally one of the greatest characters that TWD had to offer, the TV show reimagined him as a doddering and annoying old man with nothing to offer, save “wisdom” that nobody was interested in. Dale was introduced way back in #3. Right off the bat, he proved to be one of the book’s easiest characters to love. First of all, there was Dale’s adorable romantic relationship with Andrea – another character ruined by the show. He was also one of the group’s most useful members, often serving as their moral center. Dale got bit by a walker and lost his leg because of it, but that didn’t keep him from trying to protect his loved ones. Unfortunately, that wasn’t the last time that he was bitten. Dale’s death in the comics was truly heartrending, because he was so beloved. However, no one blinked at his demise on the show, because no one cared. Dale was one of the unsung heroes of the series. He was brave, funny, and kindhearted. It is a shame that the show couldn’t find a way to translate any of that. In the earlier issues of The Walking Dead, Maggie was largely defined by her romance with Glenn. Losing him destroyed her, but Maggie Greene didn’t break. Instead, she went on to become one of Rick’s most valuable allies and later, the leader of the Hilltop community. Maggie was always so full of life and yet, the world terrified her. How could it not? While Glenn’s death may have hardened her, the grief never kept Maggie from being a good mother to her children and a fair leader to her people. When Rick was the one who lost the plot, she was right there to help him find his way to reason, even though it took a punch in the face to get through to him. Maggie’s tenure at the Hilltop has not always gone smoothly, but she faced the trouble head on. Not even an assassination attempt could keep this girl down! Initially, that mission was escorting Eugene to Washington D.C. in order to save mankind. When Eugene’s ruse was revealed, Abraham briefly lost his way. However, backing up Rick and protecting his loved ones was paramount. That became his purpose. It helped to balance out all the destruction that Abraham had left in his wake, things that still kept him up at night. There were so many actions that he could not forgive himself for, because despite his propensity to kill first and ask questions later, Abraham was a good man. If The Walking Dead has proven one thing, it’s that there is no creature more monstrous than man. Zombies have only ever been a catalyst and the living are the true villains of the piece. Before Negan, the Governor was the worst Big Bad that our survivors had encountered. He was a good antagonist, but very two-dimensional. Enter Negan, a character who continues to surprise. He has somehow become a fan favorite, despite the fact that he killed off one of the most beloved characters in the book. Much of this is due to Negan’s winning personality and the much-needed levity that he brings into the mix. That’s not all, though. Negan is an incredibly complex character and readers have gotten particularly invested in the former villain’s fate. Negan has committed unforgivable acts, but he has also recently proven his loyalty to Rick. After defeating him, Rick chose to imprison Negan, rather than kill him. It seemed that this was destined to blow up in his face, but when Negan finally did escape, he didn’t go after Rick, but rather killed Alpha – the leader of the Whisperers – instead. Negan’s backstory has been slowly fleshed out recently in Image Plus, four pages at a time, adding much more depth to the character. Whether Negan will continue to be a friend or revert back to being a foe remains to be seen, but we are all waiting to see what happens next. Tyreese was a flawed man, which made him all the more relatable. After witnessing the failed suicide pact between his daughter and her boyfriend, he murdered the latter without a thought. While it was a terrifying scene to walk in on, Tyreese’s reaction was equally scary. That was hardly Tyreese’s only questionable action. Much like Abraham, he also had his fair share of lady drama. However, despite his faults, Tyreese became integral to the group’s survival. Tyreese was a larger than life figure, whose tragic death impacted both the survivors and those reading TWD. Initially, Carl was so broken that any form of happiness felt like a lie. Let’s not forget that he shot Shane at just nine years old and that wasn't the last person that he would kill. Plus, there was that whole "getting shot in the face" thing. 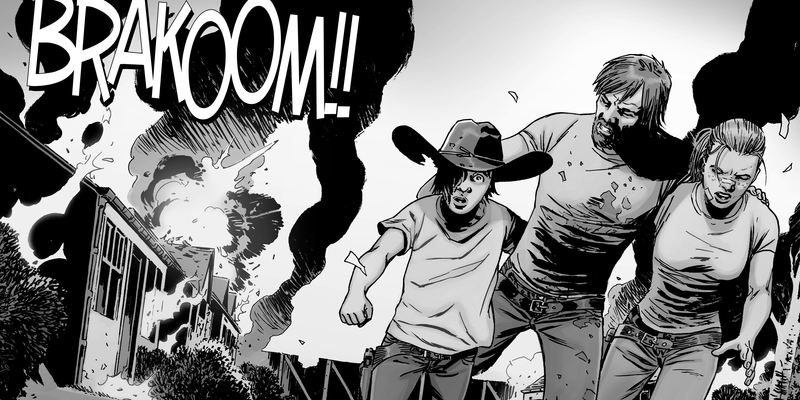 However, Carl has really grown up, especially since the time jump in #127. He is able to coexist with others in the community and even decided to apprentice as a blacksmith. Carl has become one tough kid and has recently even found love with Lydia. This is TWD, though, so that probably won’t last. Sure, sometimes Carl’s more violent tendencies take hold of him – those kids seriously had it coming, though – and he is often conflicted, but considering everything he’s survived, Carl is doing kind of amazing. He is smart, capable, and never even flinches in the face of insurmountable odds. Carl has become one of the book's most fascinating characters and continues to grow with every issue. Of the many gruesome, shocking and soul crushing deaths in The Walking Dead, none hit fans quite so hard as when Negan bashed in Glenn’s skull. He made it all the way from #2 to #100, which is no small feat in TWD, and fans had become very attached. Of all our core characters, Glenn was easily the most likable. He was selfless, resourceful, and brave to a fault. There was nothing that Glenn would not do to help ensure the group’s survival. From the very beginning, before he even really knew anyone all that well, he was risking his life for them. Glenn was a loving husband to Maggie and an excellent father figure to Sophia, although sadly, he was not able to be there for his own son, Hershel. Glenn’s heartbreaking final word was "Maggie", as Negan brutally beat him to death. His passing rocked everyone to their core. It wasn’t because he had been vital to their survival – although he was – but because he was the best of all of them. Glenn was one of the only the survivors throughout the entire series who never took a living human life. While it is true that the Glenn’s abhorrence of violence made him one of the more vulnerable members of the group, his unparalleled bravery more than made up for it. As evidenced by this list, TWD has killed off many incredible characters, but Glenn will never be forgotten. So much of The Walking Dead has been a character study of Rick Grimes. Some fans feel that so many engaging characters now populate the book that it could survive without him. However, the fact remains that Rick is still the central figure. Perhaps TWD would work fine without him – let’s face it, no one is safe in that book – but Rick has had the most complete arc of the series thus far. You want to talk about a survivor? Michonne has been through more than most in a comic rife with tragedy and she remains one of the book’s strongest characters. She epitomizes what it means to be a survivor. The fact that Michonne has experienced so much makes her incredibly empathetic, but she does often lack compassion due to the fact that she has a propensity to bottle her own feelings. Michonne has lost all three men that she was romantically involved with since the outbreak and that’s not even including the guy she was with when the world was plunged into chaos. When he and his friend were turned, Michonne hacked off their arms and jaws, and proceeded to use them as her walker escorts. Although Michonne’s strength is a huge asset to her fellow survivors, at times it makes her feel as though she has lost touch with her humanity. Deep down, Michonne has never forgiven herself for not finding her daughters after the outbreak. It is her rock solid relationships with Rick and Carl that really keep her tethered to the rest of the survivors. She may not love herself, but she is loved and appreciated by everyone around her. Dale wasn’t the only character to be ruined by the show. The characterization of Andrea was even more egregious. She was melodramatic and just plain irritating. Worse still, she was unsure of her allegiances. This was especially heartbreaking, because Andrea is the best character in the comics. She only just comes out ahead of Michonne who – although undeniably awesome – really hasn’t evolved much throughout the series. Andrea, on the other hand, is barely recognizable from the sweet girl we were introduced to all the way back in #2. Like everyone who has been left standing, Andrea has lost more than most people could bear, but she has become all the stronger for it. Despite all the pain and horror that she has experienced, she has found happiness with Rick and Carl as her family. She is a loving and caring mother to Carl, and is more than just Rick’s girlfriend; she's a true partner to him. Andrea is inarguably one of the most valuable members of the community, with her unparalleled skills as a sharp shooter. She is incredibly supportive to everyone around her and her role as lookout is crucial to Alexandria’s survival. The Walking Dead has become known for killing off beloved characters and thus far, Andrea has managed to survive longer than almost everyone. However, #165 ended on a cliffhanger of Andrea getting bitten on the neck! Unfortunately, we’ll have to wait until April 5th to discover her fate. Who are your favorite characters in the Walking Dead comic? Let us know in the comments!